When looking for a luxury bike vacation on your next Minnesota getaway consider giving Gary and Sandra a call, for a little slice of heaven. Tucked in the trees along the shoreline of Leech Lake is a peaceful and beautiful home away from home, at the Leech Lake Bed & Breakfast. 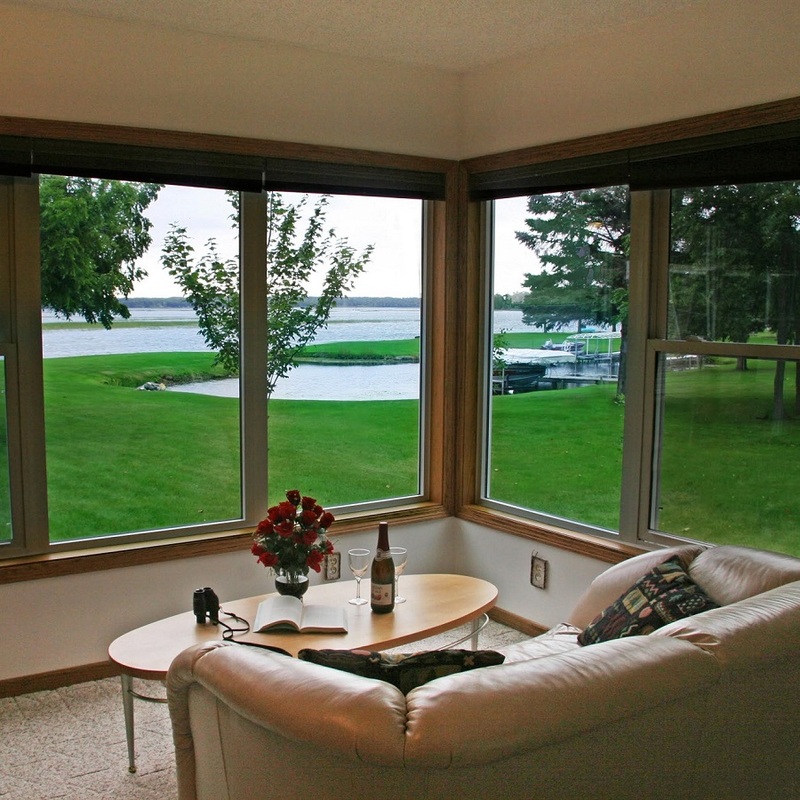 This lakefront lodge, located North of Walker, MN is the perfect place to stay for a relaxing vacation, spring, summer or fall, in luxury at fair price. The Leech Lake Bed & Breakfast makes you feel right at home as soon as you walk in. With Northwoods themed rooms, any of their suites would be a wonderful place to stay. A relaxing sight on your luxury bike vacation, from the Harbor View Suite at Leech Lake B & B.
I got a sneak peak at the Up North and Harbor View suites. The Harbor View suite has a large window overlooking the lake with a comfy couch to spend hours on, soaking in the view with a good book. Gary says, ” the majority of people that stay in that suite hardly leave the couch and usually take breakfast in their room, just to enjoy the view”. 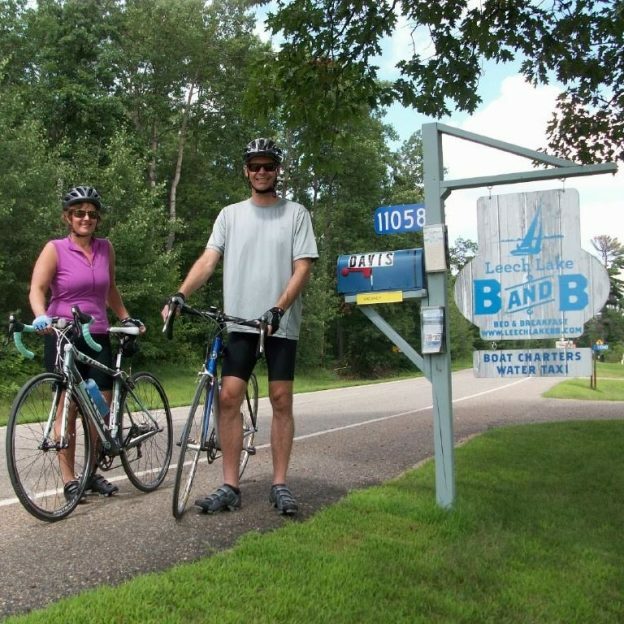 The B&B here is situated on the Paul Bunyan Trail and close to the Heartland Trail to plan some wonderful biking adventures. The Heartland Trail was the first rails-to-trails in the world and connects to the Paul Bunyan. If you don’t have a bike or don’t want to bring yours along, Gary and Sandra have bikes you can borrow, included with the room cost. Gary will even map out where the best sights are on the trail. He also can recommend where to go depending the length and level of a ride (your preference). 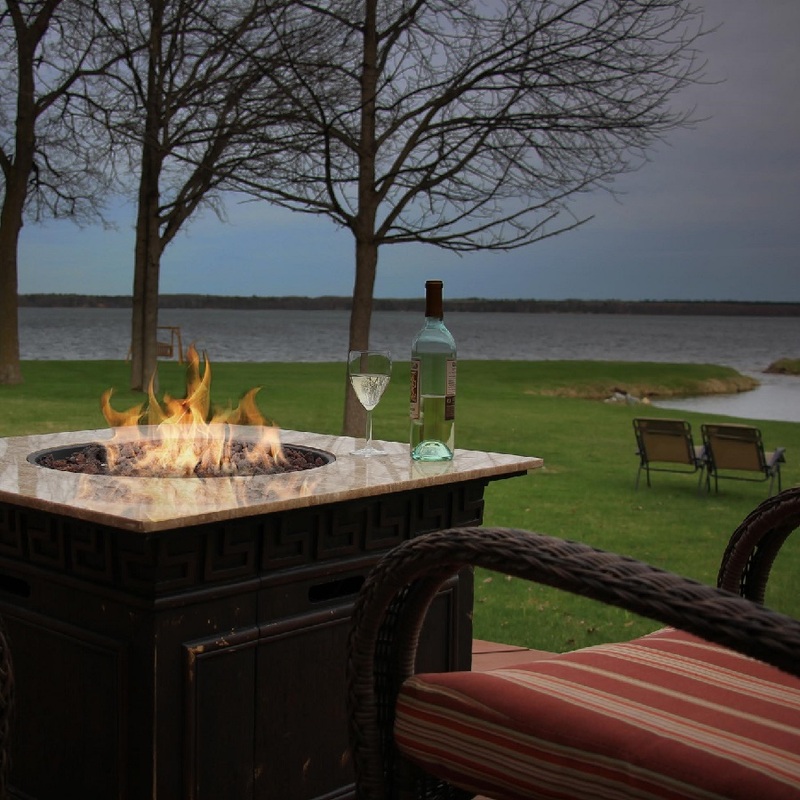 On your next luxury bike vacation relax on the deck near the Leech Lake B & B fire pit with a lake view. The B & B ensures that you have fun on your luxury bike vacation. With 24 boats to choose from (seven included with your room) you can spend time on the lake when not biking. So whether it’s by kayak, canoe, or a stand-up paddleboard, you are sure to have a good time exploring the lake. For the golfers out there, get a 25% discount at two of the local golf course by staying at the Leech Lake Bed & Breakfast. If you want to stay in and relax for a night, they have a DVD collection for you to choose from. Another option is to enjoy the bonfire on their patio or spend some time in any of the comfy chairs they have on the back lawn overlooking the lake. You could also spend time reading on the “island” at the end of the dock. In the words of Gary, “if we don’t have good beds and we don’t have a breakfast they’re gonna make us change the sign out front.” While I did not get to taste the breakfast, the guests raved about it. 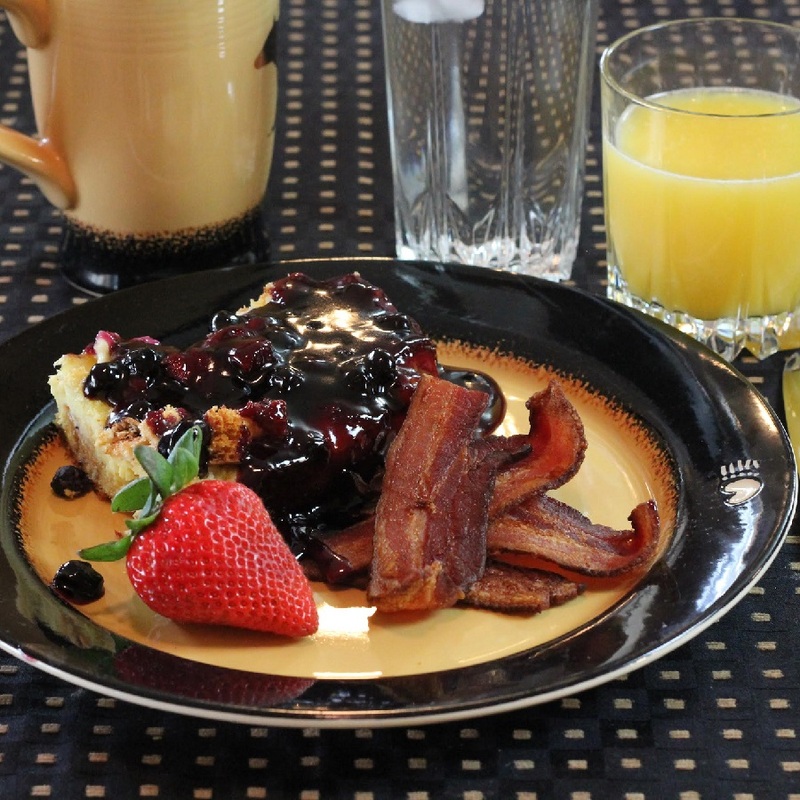 Enjoy one of the special Leech Lake B & B breakfasts before your day of fun. All of the guests have access to a large shared refrigerator as well as the 24-hour coffee, tea, and treat bar. Besides the expected variety of teas at this bar, they also have homemade spiced chai that Gary and Sandra make themselves. To help you decide where to get lunch or dinner, Sandra has collected menus from all of the local restaurants. So the next time you are in the Walker area looking for a place to stay, look no further than the Leech Lake Bed & Breakfast for a luxury bike vacation. It’s a little slice of heaven right on Leech Lake. This entry was posted in News and tagged #FindYourNextAdventure, #onlyinMN, Heartland Trail, Leech Lake B & B, Leech Lake Chamber of Commerce, mountain biking fun, Paull Bunyan trail on July 11, 2016 by Andrew Ellis.